Check-In: 1 P.M. or later on the day of arrival (No early Check-In). See night host cabinet located at the front entrance. Locate your reservation packet with your last name, site number, and proceed to the designated site. Our office is open daily at 8:00 AM. Please stop by the office by 10:00 A.M the following morning to complete your registration. Please make arrangements prior to 10 A.M. if you would like to extend your stay. No exceptions on late check out! A late fee of $25 every 15 minutes will be applicable on your reservation until your departure. • Only site types can be guaranteed, we do not guarantee site numbers. • Rates listed are for two people, no pets, and do not include holiday surcharges. • Propane fires only. No wood fires or charcoal BBQ fires. • No scooters, skateboards or roller-skates. Bicycles may be ridden from 8:00 am to dusk in a safe and reasonable manner. • No Dogs/Pets allowed in the restrooms. • No smoking allowed in the restrooms. • Parents are responsible for their children. Especially in restrooms, laundry and recreation areas. • Wi-Fi is available throughout the park. NO STREAMING. • Both dogs and alcoholic beverages are PROHIBITED on Los Angeles County Beaches. • Accidents happen; however, we reserve the right to seek reimbursement for damaged property. • No Firearms, Fireworks or Explosives. • If you dump or spill sewage — $100 fine. • Please respect the rights of guests; stay on your site. DO NOT cross, obstruct, or utilize any other site than yours. • Please drive slowly — SPEED LIMIT IS 5 MPH. • STOP at the stop sign and display your parking tag before entering the park. • Vehicles parked in an unauthorized area without a registration tag are subject to tow. All non-RV vehicles must display a registration tag. • Only one RV is allowed per site. On approved sites you may be able to park an additional vehicle. All approved vehicles, must fit on the assigned sites with tires off the pavement or will need to park elsewhere. • Management reserves the right to move you to another site if necessary. • There is a maximum of 7 people per site at one time, including guests. • No sleeping outside your RV. • All RV drain outlets must be closed before leaving your site. • All drains must have an airtight connection to the park outlets or an approved closed container. • We have a dump station available for all guests, located in the upper parking lot. 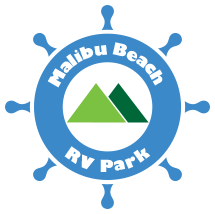 • Customer vehicle repairs and/or modifications are not allowed within the park — commercial RV repair services only. • Tow and guest vehicles must be parked in an approved area and MUST display a tag. • Truck camper or shells may not be removed from the truck. • All RVs must be commercially manufactured. “Homemade” or modified vehicles are not allowed. • There is a maximum of 4 people and 2 enclosed tents per site, including guests. Parking for 1 car is included in the price. • The registered guest must be 21 years of age to reserve a tent site. • No sleeping in a vehicle. • You must sleep in an enclosed tent. • No ANIMALS/PETS are allowed in the tent area, including service animals. • There is a maximum stay of 14 nights per year, with a maximum stay of 1 week. After a maximum tent stay, the guest must depart the park for 7 nights. This may be done 2 times in a calendar year. • There is no check-in for the tent area after dark. You must cancel or modify your reservation 3 days prior to your arrival or you will forfeit your entire deposit. A $20.00 cancellation/modification fee is applicable to all reservations.